At the beginning of the week I was going to rant and rave about Amazon and complain bitterly about the Daily Book Deals they were sending through to me. They changed the one at the top, but all the others shown are exactly the same, day after day after day, for over two weeks now. However, all is instantly forgiven and now I love Amazon. Why? Well this is not going to be a good picture, I think my hands were shaking too much! 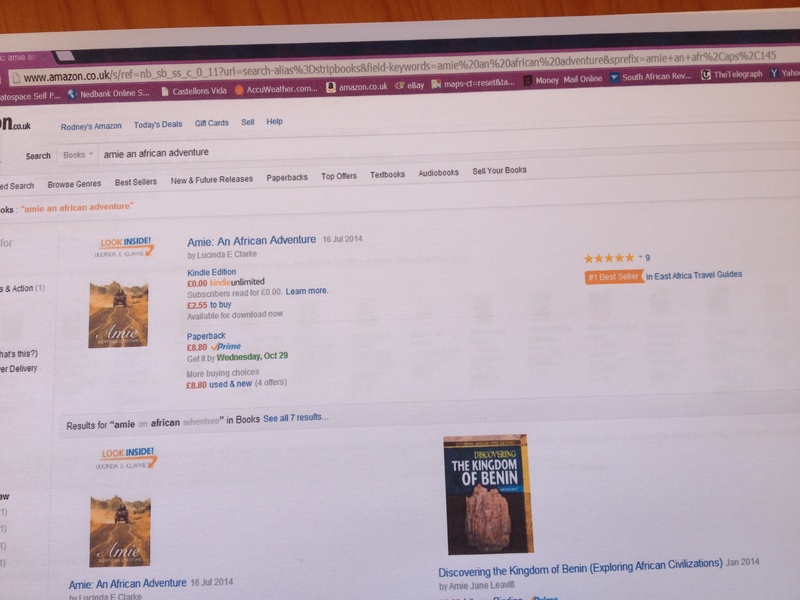 In case you have gone totally squint eyed, the pictures show ‘Amie an African Adventure’ got to #1 on Amazon.co.uk in genre. Not for very long I must say modestly, as I noticed by the time I got DH to apply his photographic skills, it had dropped to #2 in one of the categories. The pic had one of those magic little yellow stickers next to it for a little while though. But, I am assured that I can now say I am a best selling author. Can’t say I feel like one and the sales are steady but nothing to set the world on fire yet, but watch this space! 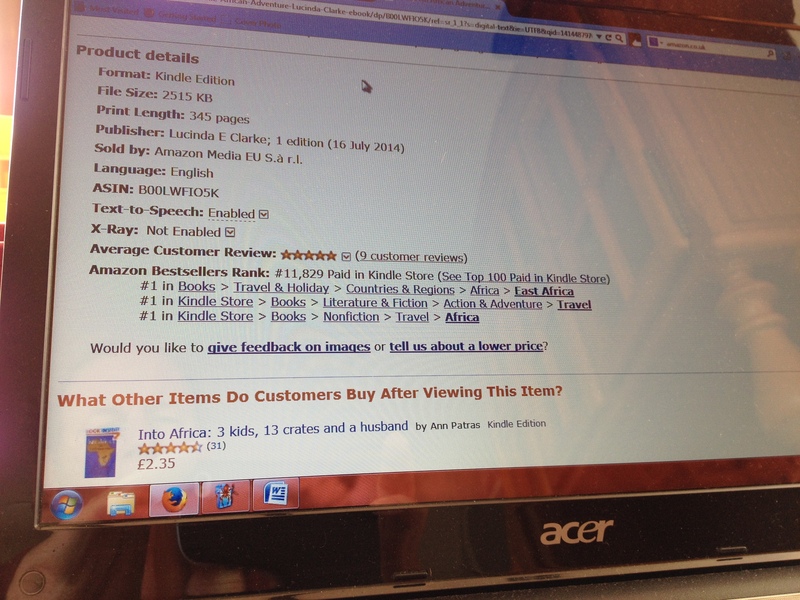 The book you see on the picture below mine is ‘Into Africa: 3 Kids, 13 Crates and a Husband’ by Ann Patras. It’s a great read by a lady who also lived in Africa and I thoroughly enjoyed it. I despair when I read other blogs which are so beautifully set out and all the pictures are in the right place. I am struggling big time here and wish I had had some computer or office training at some stage in my life. The problem at my age is I find out how to perform an action, and then if I don’t repeat it frequently the new knowledge flies out of the window and I have to teach myself all over again. It’s exhausting! I see WordPress has inserted a little red dustbin at the bottom of the page, is this a hint I am lowering their standards and they are inviting me to trash this before I go any further? I wouldn’t be surprised. Not blogged much lately as I have been finalizing my third book ‘Truth, Lies and Propaganda.’ I am two thirds way through ‘More Truth, Lies and Propaganda’, but that will have to go on the back burner for a few weeks as I catch up on life. We have agonized over the cover, but I think we can make it work. I can’t remember if I have posted a pic of the cover, [that’s how bad it is!] but if not I will save that for next time. It should be out by the middle of November. Last bit of news. There is a promotion on for ‘Walking over Eggshells’ tomorrow with eBookStage a new readers’ site where they’ll send you ebookstage recommendations tailored to your taste. Look them up on http://www.ebookstage.com. I get emails from them about books I might like to read and they seem to choose some really good ones. Anyway, for one day only WoE will be $0.99 and £0.77 – that’s tomorrow Friday 31st October. Would you believe that as late as yesterday lunchtime I still had no title for New Book 3?The midnight deadline was looming, hanging over me like the sword of Damocles. I had spent many sleepless nights, even pacing the house at 5am, fretting about it. Running a competition was such a good idea I had thought at the time. I was wrong. I could never have imagined what anguish I would go through! I’d had over 50 suggestions and for one reason or another nothing seemed to gel, none of them seemed exactly right. Then out of the blue, just as I was commiserating with another local author at his book signing yesterday morning, my phone did one of it’s burbly things, telling me I had a message. At first I was not even sure who it was from, it simply said “Truth, Lies and Propaganda,” and that was IT! The title just screamed ‘use me!’ I discovered it came from a friend I’d not spoken to in a while, who had not entered the competition, who does not even have a Facebook page and, as far as I know, has never read my blog. [She has a pathological aversion to social media]. 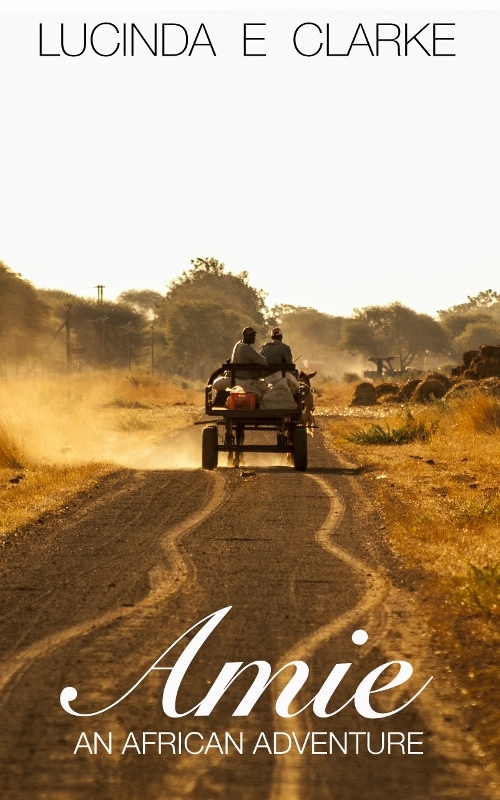 I had just mentioned in passing weeks ago I was looking for a title for my new book on my media work in South Africa. OK, she has been in that industry and also in South Africa. What prompted her to send me a message at that precise time I’ll never know, and I have still to tell her she came up with the title that gelled for me. However, she does not qualify for the prize, though I think she deserves a copy of the book when it comes out, but I still want to award the prize to someone who took the time and effort to enter and follow the rules. As promised, I want to send a signed copy of the paperback version to one of the contestants, and I thought that would be a headache until I looked at my list again and there was one clear winner. Nancy I will post your signed paperback copy over to you in the US, I think you are in Maine yes? This should be sometime in November, not sure of the exact date yet. I still need to do the corrections from editor and beta readers and then we publish, although that part is the quickest bit. To all the other entrants, [and there were lots more than I expected], a HUGE thank you and I will be PM’ing all of you [ugh, what awful English] and you will each receive a copy of the kindle version again, sometime in November. If you do not receive a PM from me in the next 48 hours, then scream loudly! Just to whet your appetites here is a preview of the new cover. [Now goes to insert picture, hopefully]. Is there no end to this woman’s brilliance! Ha ha. There is a strange story behind this shot as I wish now, I had taken more pictures of the crew when we were out on location. 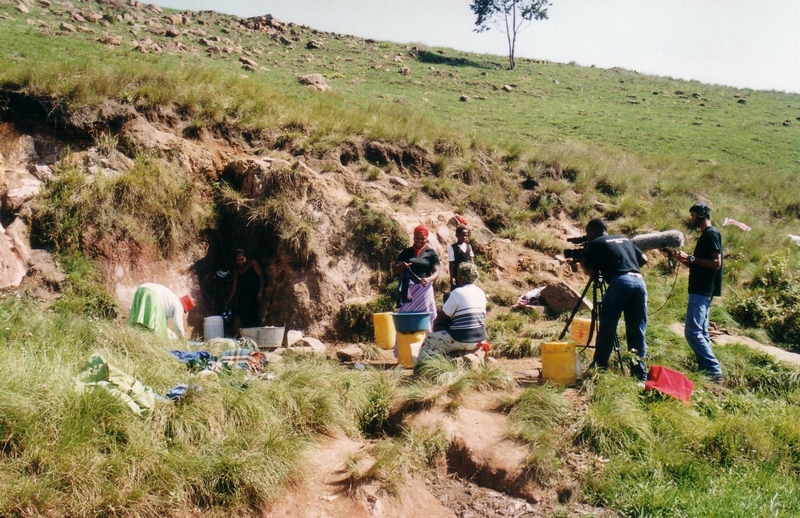 I can’t honestly remember what programme this was for, I think I must have decided it would make a good stock shot, – extra scenes you shoot in the hope they will be useful one day – as I saw these women doing their washing at this spring in the Valley of a Thousand Hills in KwaZulu Natal, South Africa. I remember slamming the brakes on and skidding to a halt and telling the crew, “Let’s get that shot, we’ll find somewhere to use it.” I can’t remember if we ever did. So thank you all for taking part in the competition and I hope you will enjoy the book as it’s got lots of funny moments and it also gives you a behind the scenes look at the world of radio, television and video. Don’t take anything you see on the small screen at face value! Believe me I’m a writer! “So when’s the next one then?” Now he is very picky when it comes to books, so I thought ha! He did enjoy my story. So I was expecting Lucinda to sit down immediately and continue telling everyone what happened next. But oh no! She is so selfish, she began to write a second book of memoirs, some nonsense about her radio and TV and video filming in Africa. She was laughing aloud as she was writing it, I’m not sure I will find it funny though, on principle. have to wait until she has completed two more books, probably next spring before she comes back to get me. I suppose she thinks people are interested in what goes on behind the scenes in television? I just might not wait around for her, that will give her a shock! Maybe I’ll move on without her, and it will serve her right. Oh and I’ve just discovered that she has dropped the price of my story to half price until Sunday 12th at midnight. Talk about adding insult to injury!! I CAN’T LIVE WITH THE GUILT!!! I feel so guilty that I have not blogged for days, but my excuse and the reason is that I have been writing. I completed the first draft today of the NEW book 3. The old one was just too dense and I had begun to go into a sort of staccato mode to cram it all in. So, a rethink, there is enough material for two books, well it does cover almost thirty years of writing stuff, and longer if you include working on the radio in Libya. The competition rules have not changed, and there is still another week to get your suggestions in to qualify for a free ebook version. With a bit of luck I can send it out in your preferred format, that sometimes works for me and sometimes doesn’t. Here are a couple of sentences from the beginning, and they follow on from the last blog. For months she has caused me unmentionable pain and heartache. I’ve sat up all night worrying about her, and if I’ve given up and gone to bed, her very presence has caused me to toss and turn until the early hours. I have to put an end to this, she’s got to go. So, how am I going to dispose of her? I will mash her to pieces in a peaceful and idyllic corn field, while the birds sing and the soft wings of the butterflies barely disturb the air. Her screams will resonate as she is dismembered into bite sized chunks between the rotating blades, and her blood spurts metres into the air turning the ripened, golden maize a brilliant red. Well what were you expecting? It’s a memoir.